Understanding the Opioid Crisis in Rural and Urban Iowa. 2019. Iowa State University Extension and Outreach, SOC 3088. By David Peters, Peter Miller, and Andrew Hochstetler. Iowa opioid deaths are low and stable compared to surrounding states. Prescription opioid deaths falling, but synthetic and heroin deaths rising. Metropolitan and micropolitan Iowa have the highest overdose death rates, primarily from heroin and synthetic opioids. Rural Iowa has low rates overall, mostly from prescription opioids. 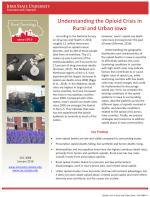 Rural opioid clusters linked to economic and law enforcement disadvantages, work in injury‐prone jobs, and limited social capital. Urban opioid clusters have economic and law enforcement advantages, but it does not seem abate opioid abuse. Limited social capital and more ethnic diversity may contribute, but the causes are unclear.